From New York Times bestselling author and Edgar Award winner Peter Blauner comes a gritty new audiobook. But when his father is found murdered near the peaceful confines of Brooklyn's Prospect Park, Natty is forced to deal with the troubled legacy of their unresolved relationship. He also has to fend off the growing suspicions of NYPD Detective Lourdes Robles, a brash Latina cop with something to prove, who thinks Natty might bear some responsibility for his father's death. Though truth be told, the list of people-cops and criminals-who wanted David Dresden out of the way is long. The search for answers leads Natty and Lourdes into an urban labyrinth where they must confront each other-and the brutal truths that could destroy them both. 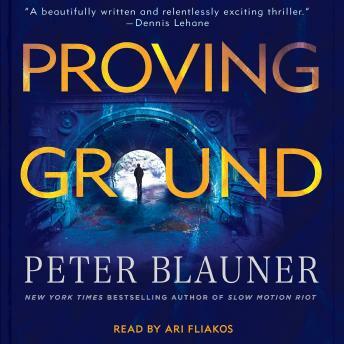 Proving Ground is Peter Blauner's first audiobook in more than a decade. It is at once a sweeping crime narrative, an intricate story about the quest for redemption, and a vibrant portrait of contemporary New York City, all told in Blauner's singular voice.